My answer is “yes”, but I like to keep things simple too! Tacos, spaghetti, and tomato basil mozzarella toasts are dinner rotation regulars. Most nights I choose from one of my favorite 30-minute meals. I’m a believer that cooking for your family at home can be just as easy as picking up a pizza or ordering take-out. (It’s less expensive and healthier too!) 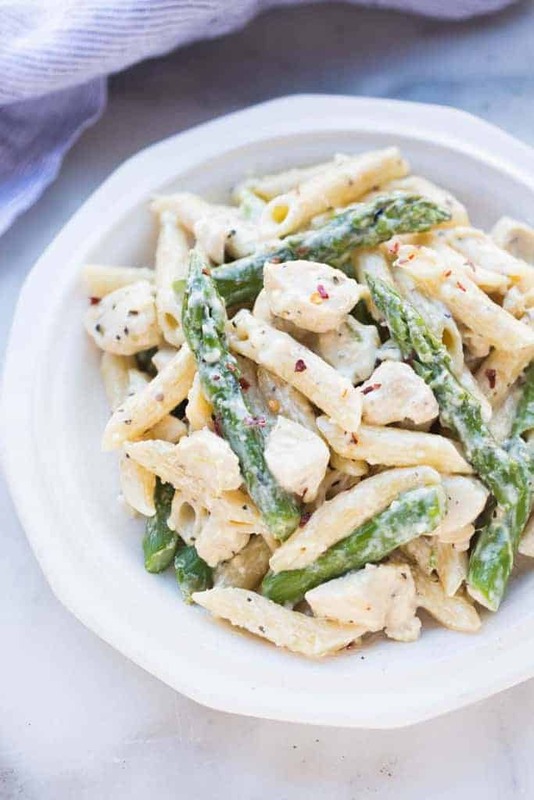 This Creamy Chicken and Asparagus Pasta can be ready, fridge to table, in 30 minutes. Start by cooking the pasta in boiling water. I add the asparagus towards the end, so that it can cook in the boiling water and I don’t have to dirty another pan. You could roast or grill it as well, and then add it to the finished pasta at the end. You could also substitute another vegetable, or add more vegetables. Next, brown the chicken. Add garlic and dry spices. Add the chicken broth and half and half. Half and half is just a mixture of half milk, and half heavy cream. You can buy it at the store, or just mix heavy cream and milk. You could also substitute regular milk for a healthier substitute, but the sauce wont be quite as creamy. Add the cream cheese and half of the parmesan cheese. Cook and stir until everything is melted and combined, and the chicken is cooked through. Add the cooked pasta and asparagus to the pan and toss to coat in the sauce. Add remaining parmesan cheese and salt and pepper. 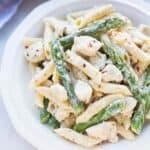 My family loves this easy pasta dish with penne noodles, chicken and asparagus tossed in a creamy parmesan sauce. Cook pasta according to package instructions. During the last 5 minutes of cooking, add the asparagus to the water. 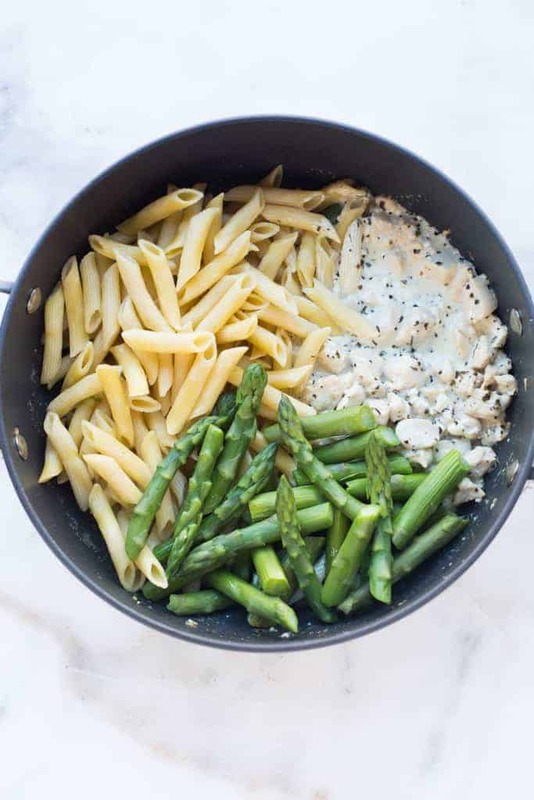 Drain pasta and asparagus. Heat olive oil in a skillet over medium-high heat. Add chicken and cook for 2 minutes, browning it on all sides. Reduce heat to medium. Add the garlic, onion powder, basil, oregano and red pepper flakes to the skillet. Cook for 2 minutes. Add chicken broth, half & half, cream cheese, and half of the parmesan cheese. Stir until well combined. 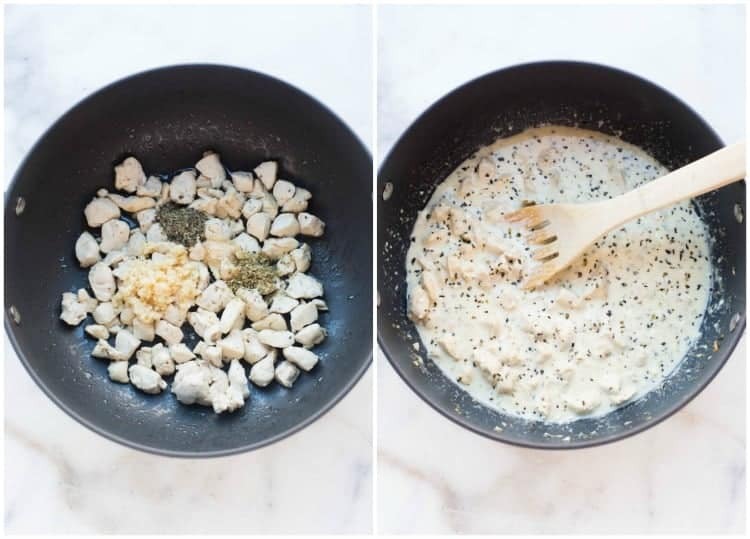 Cook until cream cheese is melted and chicken is cooked through. Add cooked pasta and asparagus toss to combine. Add remaining parmesan cheese and salt and pepper, to taste. Taste and adjust seasonings, if needed. You could also add a splash of milk or chicken broth to thin the sauce, if needed. I originally shared this recipe in July 2014. Updated January 2018. Delicious! I made it exactly as recipe stated, we all loved it! 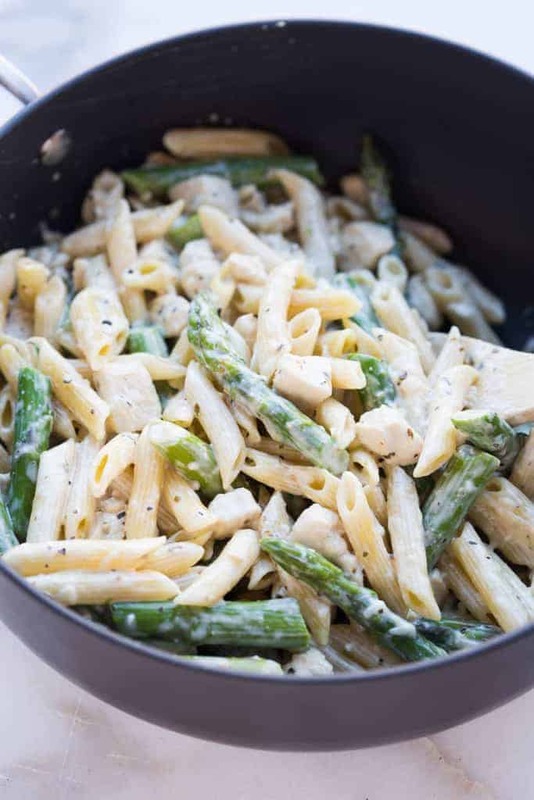 I am a first time visitor to your blog- I found this recipe by googling for asparagus pasta. I made this tonight and my husband and I both loved it! I never really think to leave reviews, but this was just that good! Will definitely check out more of the blog. Thank you! Thanks so much Kim–I’m so happy you found me and I hope you get to try more recipes here soon!